‍This blog is an accompaniment to a presentation given by Mike Fisher during Wuhan Placemaking Week. Community creativity and wisdom is the lifeblood of the placemaking process. And now that the placemaking movement has set down deep roots in New Zealand and Australia, that creativity is changing the face of cities like Christchurch and Adelaide, where placemaking projects are bubbling up in seemingly unlikely situations. 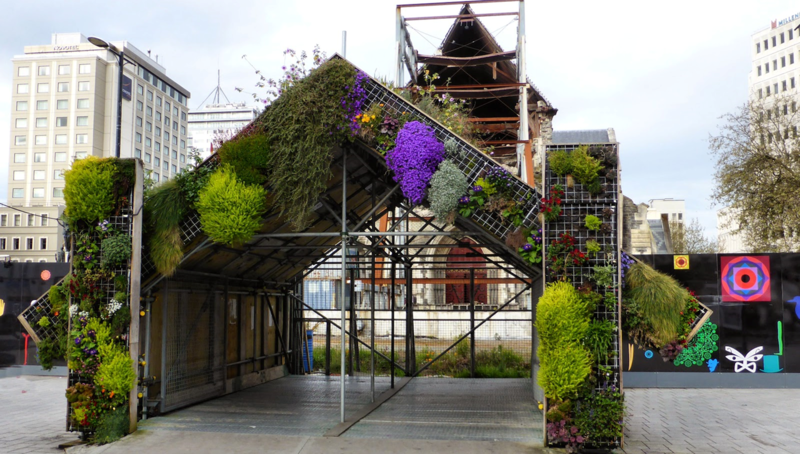 In Christchurch, place-based creativity was perhaps most apparent in the weeks and months after a magnitude 6.3 earthquake in 2011. As we have seen in other disaster recovery situations, locals pooled their ideas and resources into public space activations that helped the city to build back better. Meanwhile, in Adelaide local officials have paved the way for community activations through hands-on facilitation of projects and drastic policy changes. Perhaps no one is more familiar with the state of placemaking in these cities than Mike Fisher, formerly of the Christchurch City Council, the Adelaide City Council, and soon to be the General Manager of the new Riverside Market in Christchurch. By weaving placemaking into local government processes, Mike has demonstrated how public spaces can play an important role in the life of a community, under both ordinary and extraordinary circumstances. Project for Public Spaces interviewed Mike about what role local government has to play in empowering the placemaking process. Q: What is the role of local government in placemaking? Is this role changing? A: As far as the role of government officials in placemaking, they are facilitators and enablers. That’s not necessarily a role the government traditionally sees itself playing, but it can enable and collaborate with the community, while contributing specialized skills. In New Zealand, planning has become known for a lot of rules, systems, and processes, so it’s become a specialist field. Placemaking is about breaking that down. For example, after the Christchurch earthquakes, the government was a bit shell-shocked and had to focus on getting basic services running. The community started doing things for themselves, creatively. The City Council then joined these efforts as an enabler, working with this community-level energy. The Council changed certain planning rules to allow for temporary placemaking activity, suspending certain restrictive planning rules for five years. This allowed for placemaking projects and temporary creative endeavors to get underway without going through the whole resource consent/planning application process. People could put their energy on projects rather filling out forms and having to find money for fees and consultants to go through the processes. In Adelaide, Australia, the ethos of the City’s Placemaking Strategy was building the capacity of the community. In my time there, we needed to be able to facilitate people in bringing projects to life, and supporting them by bringing together City Council resources across various departments. We put in place a group of Place Facilitators to develop relationships and trust in the community, forming a bridge between the government and the people. Our goal was also to use our knowledge and skills to help shape ideas and make them work, instead of squashing them. In order to better enable activity to happen, the City Council found 501 or so restrictive policies including those governing public space uses, and in one meeting removed around 206 of them and began a review of another 115. Unnecessarily restrictive things like busking bans in some places, for example, had built up over the years, and getting rid of many of them in one meeting gave huge signals that the Council was getting out of the way. Local news coverage of Adelaide City Council's decision to eliminate 200+ restrictive policies. Q: How is placemaking changing the way the city planning process unfolds? A: Placemaking provides unique inspiration and motivation for planners. In my case, as a traditionally trained town planner, placemaking has given me new insight into the deep attachment people can have to place and tools to do things differently, to test and trial ideas. It links local, place-based solutions with broader long-term strategies and provides tools for quick action alongside local people. In Adelaide, an observation exercise called PramCam kicked off by attaching cameras to strollers and prams — all to get a better idea of how people navigate city streets with children. PramCam led longer-term placemaking projects, including a local push for carbon-neutral green street; leading from implementing locals’ ideas on one local street to more global sustainability aims. Placemaking helps to refocus planning on local ownership and involvement, as well as understanding how places work. Most planning processes are mainly reserved for experts, whereas placemaking lets everyone in and finds solutions at the local level. Placemaking also allows things to happen quickly; “Lighter, Quicker, Cheaper.” People can see change, and especially for people who think planning is expensive and all about town hall meetings, this aspect changes their perspective dramatically. With placemaking, people see things happen on the ground, and can test and see how things work. As a result, planning can now engage deeply with people, and observe how places work. Planning changes a lot when you use a placemaking model or a place-led approach — it will change your whole way of doing things as a planner; moving towards experimentation, deep engagement, observations of people in place, unexpected collaborations, and avoidance of top-down approaches. Q: What are some unique approaches to placemaking that you've seen in New Zealand and Australian cities? A: I’d like to think that there are many, starting with place observation and evaluation. Observation and understanding of public space, through projects like PramCam in Adelaide, gave a view of people that sometimes get left behind in the planning process. 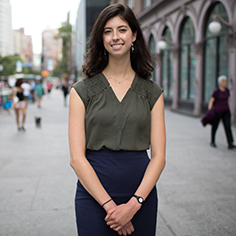 It gives a view of how people move around, how they use the streets, and what it’s like to get from place to place with a child in the city. In Adelaide, we also used a tool called Place Capital Inventory, and through observation we could take the temperature of places using various indicators, from the social to the cultural or environmental. We had a suite of indicators, from retail spending to carbon emissions, that gave us a unique approach to placemaking. Kid-led observations of public spaces in Christchurch. In Christchurch, kid-led observation techniques are letting the younger users of public spaces get into observation and make changes that matter to them. The process helps people understand how the place shapes them, and how they shape the place. Many creative placemaking activities based upon Indigenous aspirations and narratives have been at the heart of the rebuild of the City and have helped recast the identity of Christchurch. The Whare (Meeting House) was designed by Chris Heaphy and built in front of the Christchurch Cathedral. Located in what is considered the colonial heart of Christchurch, Cathedral Square, the structure gave a clear nod to the rich culture and stories that existed before the Cathedral, and acknowledged the significance of the area to Maori people. Whare (Meeting House) in front of the Christchurch Cathedral. We also have Matapopore, an organisation formed after the earthquakes that I consider one of our taonga (treasures) that has come from the rebuild. They have been a leading light in reimagining Christchurch and weaving the aspirations and incredible narratives of our local Iwi (Indigenous nations) into the City as it is rebuilt. The placemaking projects that they have been involved in have shown the world how Indigenous cultures can shape the design of place. Q: You've said in the past that relationships are one of the most important outcomes of the placemaking process. Why is that? A: For me, relationships make the world go ‘round. That’s what cities are made of; complex webs of social interactions. Humans are social animals, and I think a lot of the time in the planning process, it’s all about delivering a project, building something, or solving a particular problem based on a physical outcome. Whereas, through a placemaking lens, you go back to how the city is actually working socially and culturally, and you understand the relationships between the people in places, their attachment to place, and tailor responses accordingly. When you need somewhere to use the bathroom or store your food after a disaster, you realize how important relationships and social networks are. For example, in Christchurch, communities with strong social networks were able to come together quickly and help one another recover after the earthquakes. A significant lesson from post-disaster placemaking is that getting people involved in collaborative public space projects helps to create and develop those potentially life-saving relationships for the future. With a place-led approach, you focus on developing relationships and trust between people, and build on the social fabric of the city. It’s not just about building something. Often times, building relationships is the stronger part of a placemaking project. The placemaking process builds stronger communities, creates understanding between different people and helps more ideas flourish as more people with more skills get involved in creating public spaces. The Dance O Mat in Christchurch, with a repurposed washing machine used to activate the installation. Q: What are some of the best examples of "lighter, quicker, cheaper" experimentation that you've seen in New Zealand? A: Experimentation is in the DNA of placemaking, and we have certainly seen that in Christchurch. Post-earthquakes, after all the destruction, experimentation started to happen with groups of locals activating public spaces. One of best-known was Gap Filler, a group that got started by laying down astroturf, bringing in a coffee truck, and putting on performances. Another group called Greening the Rubble experimented with urban ecology projects in areas damaged by the earthquake; yet another sign of the willingness to trial and test. The Dance O Mat in Christchurch, a Gap Filler project, was an experimental public space activation that saw an average of six hours of use a day, in a city where it was said no one would dance in public. People were willing to put $2 into a repurposed washing machine, turn the lights on, and dance. Gap Filler also responded to a loss of studios and venues across the city with a “pallet pavilion” built out of wooden shipping pallets. A group of volunteers came together and built a pavilion, and part of the whole experiment was whether people would come and use it. In the end, it turned out to be a great success and a much-loved venue. On Adelaide’s Pitt Street, working closely with the local traders we got rid of car parking. In an unusual move, the businesses and organizations on the street led the removal of car parking spaces on a temporary basis when they saw the poor experience customers were having. 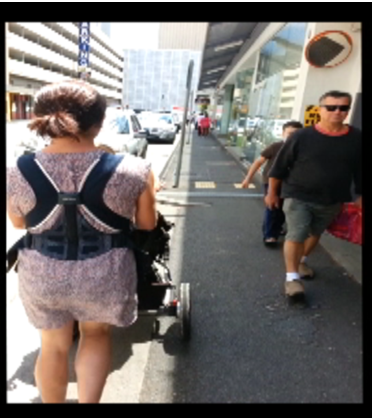 This was one of the streets where we used PramCam, which helped illustrate the poor experience people were having. Removing the car parking and widening the footpath changed the character of the street completely. Through the short-term experiment in removing the parking spaces, it became a “people place,” leading to a bigger conversation around the larger vision for the street and more permanent changes that could be created. Experimentation has opened up new possibilities and helps to proposition new uses of public spaces that were not even thought of previously. Experimentation is frowned upon in many professions, but it is central to placemaking. You don’t have to have all the final answers — you can experiment as you go. I have found that very few people would rather sit in a public meeting than brainstorm and then experiment collaboratively and get some quick results. Q: How did placemaking play a role in post-disaster recovery in Christchurch? A: On a larger level, placemaking has played the role of allowing people to take action, feel involved, and physically engage in the rebuild of the city. Previously, people were quite disengaged with the formal planning process and found that it can be quite adversarial. Placemaking is the vehicle for people to think, this is my street and my neighborhood, and I can get involved in building it back much better than before. It’s transformational, getting people involved, seeding unexpected collaborations, filling the gaps, and seeing quick, direct action. At a place level with some areas and buildings closed off to people, it made people realize what they missed, the memories they had in different places — really about place attachment. People realized how important many of their connections were to their local community through their neighborhood, their schools, and their churches when these things were not there anymore. They found out what they missed, and were able to see what is important, and what places are crucial to a sense of community. Q: How can local policies empower public space activation? A: Policies are often put in place to disable certain things from happening, whether a restriction on outdoor dining, busking, or something else. Placemaking policies, however, are focused on enabling. So what remains is figuring out how to take involved people and informal networks, and get them involved in more formal decisions. In Adelaide, we started by experimenting and building governance systems that allowed people to make decisions as to what happens to their public spaces. Formal decisions could be made by the people working on placemaking and public space projects. This was a whole new approach to sharing power and control, enabling future placemaking projects to happen .